Spray 13x9-inch (3-quart) baking dish with nonstick cooking spray. Sprinkle half of cheese evenly into sprayed baking dish. Melt butter in medium skillet over medium heat. Add onions, 1/2 medium bell pepper and mushrooms; cook until onions and bell pepper are tender. Arrange vegetables over cheese in baking dish. 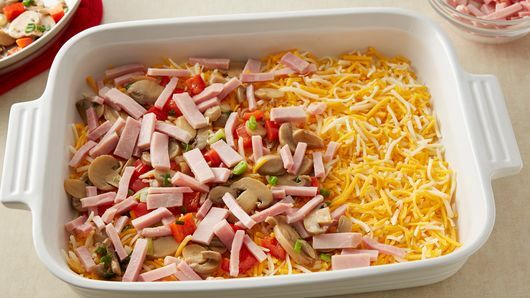 Top with ham strips. Sprinkle remaining cheese over ham. Beat eggs in large bowl. Lightly spoon flour into measuring cup; level off. Add flour, parsley and milk to eggs; blend well. Pour over mixture in baking dish. Cover; refrigerate 8 hours or overnight. To serve, heat oven to 350°F. Uncover baking dish; bake at 350°F. for 55 to 65 minutes or until mixture is set and top is lightly browned. Let stand 10 minutes before serving. To serve, cut into squares. Garnish with red bell pepper and fresh parsley. 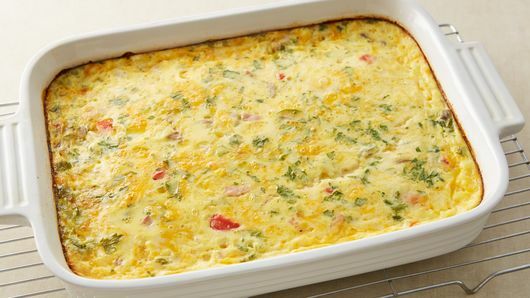 Making this ahead of time to serve for a breakfast or brunch frees you up to put the rest of a company meal together. But you don’t have to wait—go ahead and bake it for a simple supper or as an offering for a potluck buffet. Go meatless. Leave out the ham and boost the mushrooms, which are high in protein. Slice up 8 oz. fresh cremini (a brown version of the common button mushroom) or shiitake mushrooms. Sauté them in the butter with the green onions, drained jarred mushrooms, and the red bell pepper until the vegetables are very tender and browned. Layer the casserole as directed. 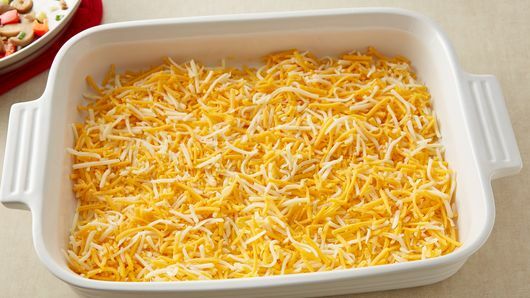 Finish the top of the casserole with a sprinkle of more shredded cheese, and a large spoonful of grated Parmesan if you’d like some zest, during the last 10 minutes of baking. With just a little bit of work the night before to prep this recipe, you’ll be poised for brunch success the following morning. 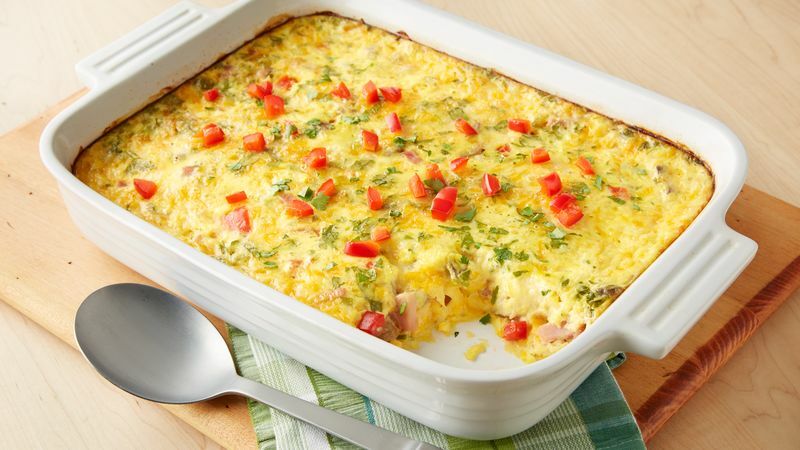 Preheat the oven, pop this ready-made egg casserole recipe in the oven, and you can go back to bed for a bit more snooze time, or make a pot of coffee and get everything ready for an epically delicious brunch. 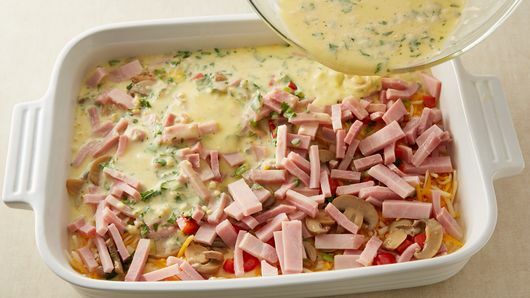 If you’ve never tried an easy egg bake before, you may not realize how much it lightens your workload in the morning, or how much everyone will want to dig into its hearty combination of eggs, cheese, veggies and ham. Best of all, you’ll only have one pan to clean up after all 12 servings of baked egg casserole have been gobbled up. Craving more quiche? Here's a collection of our top-rated quiche recipes.